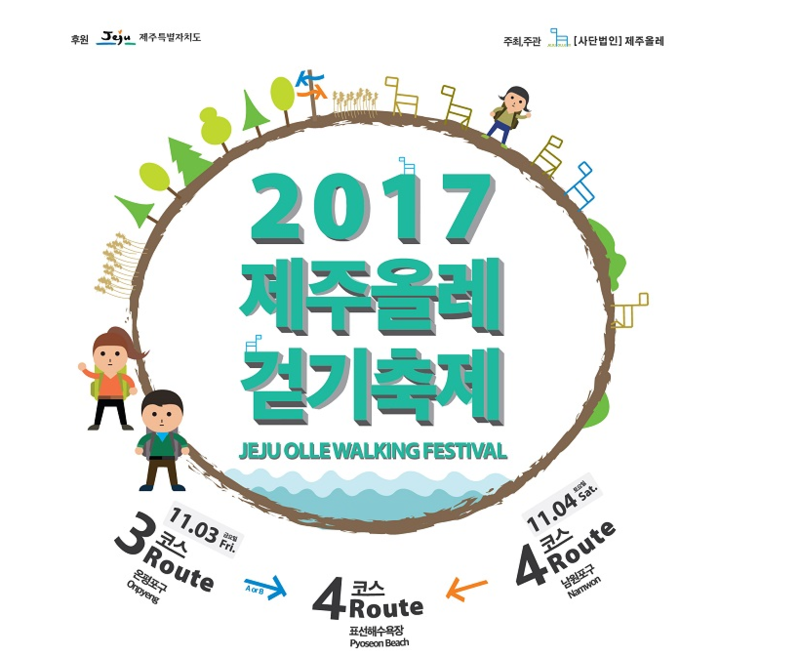 A complete guide to 2017 Jeju Olle Walking Festival on Nov. 3 ~ 4. First held in 2010, Jeju Olle Walking Festival is celebrating its 8th year and will take place on Nov. 3 ~ Nov. 4, in Jeju's most beautiful season of fall. It's a festival that keeps you going, walking one trail course a day and enjoying the culture, arts, performance as well as a variety of local foods. More than 10,000 participants are expected to come this year from all around the world, including Taiwan, the United States, the United Kingdom, Japan, Canada and, of course, many different regions of Korea. The festival is also joined by volunteers, local residents who offer unique experiences, foods and outstanding performers. * You can choose either 3-A or 3-B. The starting/finishing point is same. - Pre-registration is required for attendees to receive the official program and souvenir. -Lunch tickets can be purchased only on-site. To purchase tickets, please mark it on the registration form and submit with the registration fee. * Please fill out registration form for pre-registration. Foreign hikers can pay on-site only. * On-site registration will be available during the festival at the registration desk for 100 attendees on a first- come first- serve basis. * Packing list: long-sleeve shirt, long pants, trekking shoes, personal cup and utensils (we do not offer food environment protection purpose) ※ For those receiving discounts, please present your ID/certificates. * A detailed daily schedule and shuttle bus timetable will be available soon. Jeju's Olle Trails reviewed and rated. Which one is the best?